Creating a new home life. H2A Architects have been collaborating with innovative Assisted Living developers, creating comfortable and inviting new home spaces for those who are seeking limited care and independence in these "new style" facilities. Learning from current care trends and carrying over successful lessons-learned, these new home environments are providing living experiences beyond what is typically expected in an assisted living facility. To help the owners visualize the project H2A created this fly-over visualization. Comforts of home, including fireplaces help create a welcoming feeling. Bella Vita of Grand Blanc offers both Assisted Living and Memory Care residential environments. An efficient building core houses shared kitchen and utility areas for the operators. Residents enjoy shared, windowed living and dining rooms. Private family spaces are available, as well. This facility, now under construction, has over 70 units available in single rooms or double. 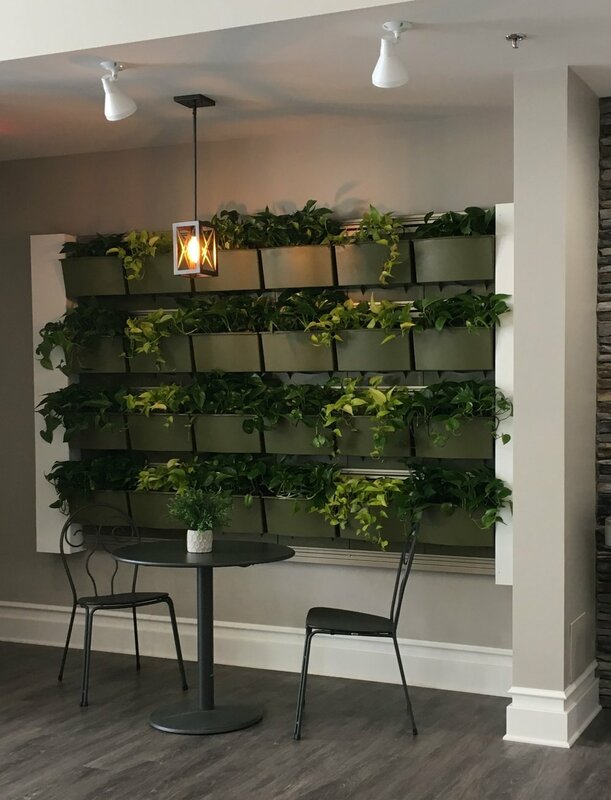 Living plant walls help to bring in color and interest to make this sitting area much more inviting. Smartly appointed colors and fixtures create comfortable walkways to residents’ rooms.